This week, I am dipping into my Peck O’ Picks to review three of my most used flat-pick plectrums. In this case, the picks are Fender™ 351-shape that fall into the “thin” or “light” category. Picks (for those that use them) are probably the least expensive and least considered, but most important parts of guitar playing. 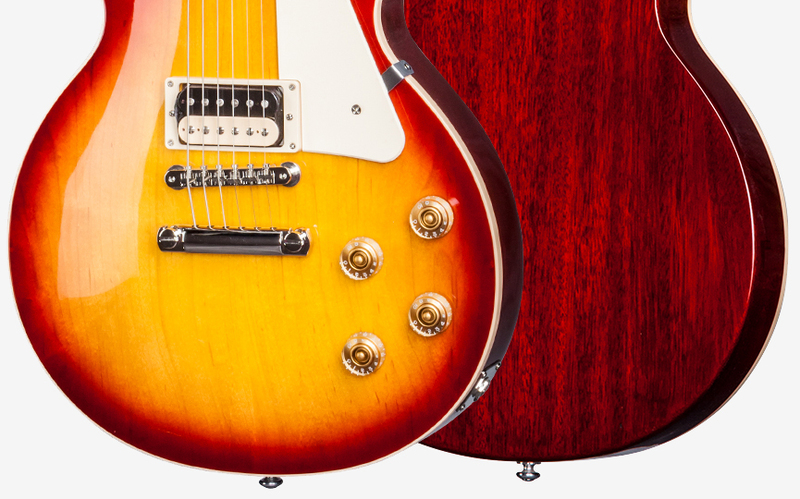 Certain types and shapes of picks are best suited to playing a given type of guitar or even a given type of playing style. The thins covered in this review are generally used for soft strumming (particularly with acoustics), and for certain types of fast picking. However, one of the least-considered and least-understood parts of picks is their affect on clarity and brightness of attack. Most folks seem to focus on comfort (important, yes) and whether or not the pick lasts through hours of playing (also important, yes). In this review, I’ll consider these factors, but will focus more on how picks make attacks sound. Of the zillions of styles, picks and materials I have for picks, I go through the thins the most. Part of the reason is that thins/lights cause a very clean, precise (if not bright) attack on a given note. If the pick is held with only a little tip exposed to the string, the guitar’s sound becomes very clear and concise. If the pick is held far back away from the tip, the sound is a little softer, but gives an interesting “clicking” sound when recording a mic-ed acoustic. It is the brightness of attack that brings me to use a thin or light pick in certain of my tunes. At times, when I’m recording one of my acoustics (particularly when I double-mic from the front of the guitar) I like to use thins to give a nice “live” effect when I’m doing strummed chords. The main disadvantage of most thin picks is that they shred, crack, tear, or outright break fairly often. Most (not all) common pick materials (celluloid and clear plastic included) will tear or break, particularly with fast or hard playing. My son cannot use a celluloid or clear plastic thin pick when he’s shredding – he’ll tear the pick within about an hour of playing something loud and hard. However, there are thin picks made of materials that will last significantly longer. In particular, the Delrin™ picks (and other brands, too, like the Dunlop™ Tortex™ and Ultex™ picks – covering those in another review sometime) last a very long time and are very hard to tear or break. In short, if you want a bright note attack, use a thin or light pick. If you need durability, use one of the other materials, such as Delrin. Note that the Delrin picks have a slightly more warm-bright attack than do celluloid or clear plastic picks. The Fender Celluloid Thin (medium pictured here): These picks come in neat “moto” colors and even some faux shell/pearl/abalone colorings. They’re generally low-cost, and can be purchased at almost any music store/catalog (an advantage). The lifetime of the celluloid picks is medium, and the attack sound is medium-bright. I like these picks for strumming 12-string guitars and my warmer-sounding guitars (Sycamore and Cedar). 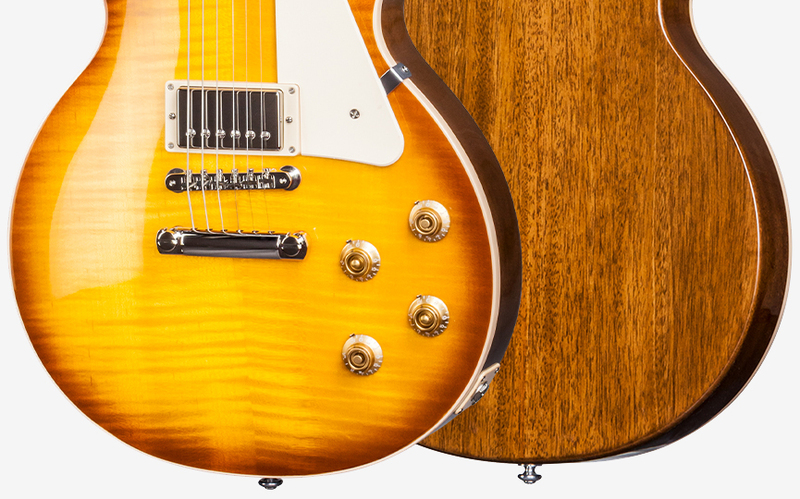 These particular picks are a very old standard, and are reliable enough to play through a jam set (most of the time) or a few weeks of light casual playing. I have only broken a few of these picks in the past couple of years – remembering that I have hundreds of picks and rotate through them frequently based on sound, style, and mood. The Fender California Clear™ Light clear plastic pick (medium pictured here): These picks have a delightful, bell-clear attack that is better than any other brand or type I’ve tried (when it comes to a bright attack). They come in lots of neat clear colors, and have a cool palm tree motif on the front. These picks are bright, but are extremely fragile. If you want brightness, and 1) have lots on hand or 2) are a very light picker, these are the picks for you. 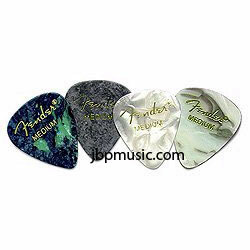 I regularly break (or more appropriately, tear) one of these picks in any given recording session or Jammin’ Rug jamming session. These picks receive awful reviews, mostly based on their short life spans. However, I always keep a dozen or so of them around specifically for their sound. I just assume that they are throw-away picks – they’re indispensable in my arsenal of sounds. 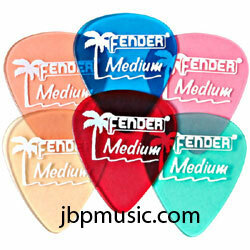 The Fender Delrin Light pick (medium pictured here): This pick generally comes in plain, bright colors, and has a delightful non-gloss, very grippy texture. When these picks are new, they are great for sweaty paws – they don’t slip around much. 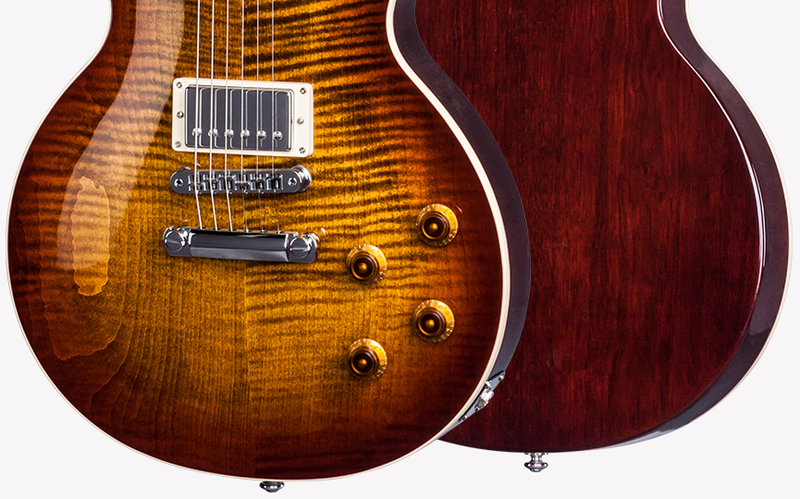 As they age, they shine up a bit, but don’t lose their edge. I have yet to break one of these, in any type of playing situation. My son has never broken one of these, either, even in two solid hours of hard rock playing and shredding. The Delrins have a bright attack, although not as clear as the Clears. These are more expensive (by a few cents) than the plastic and celluloid picks. They are also very hard to find in even mega-stores. I tend to buy these online by the dozen. We’ll dive back into the Peck O’ Picks again soon to look at Nylons, and some other great brands of picks.